The annual Vegetarian Festival is this year expected to once again draw a large crowd, despite the economic hardships currently being experienced in Thailand and the world. The event will take place over the 10-day period September 28 to October 8. The festival, which will take place at the Sawang Boriboon Thammasathan Foundation and is held mainly for Thai people of Chinese descent, is being supported by Pattaya City with a budget of 1.8 million baht. Chefs at the festival will use 500kg of dry noodles to make Imperial Noodles that will form the centerpiece of the event. The Imperial Noodles, served up to all those taking part, will be cooked in a giant pan measuring 3.5 meters in diameter. The ingredients will include 500kg of dry “mee sua”, which is the main ingredient, along with shiitake mushrooms, carrots, Chinese lettuce, bean sprouts and asparagus. It is estimated that 5,000 dishes will be distributed. Religious ceremonies would be performed throughout the opening day, September 28, starting at 9 a.m. At 12:19 p.m. a parade would start from Bali Hai Pier and travel through Walking Street. After this it would divide, one line passing along Pattaya Beach Road through to the Central Pattaya Junction, the other passing along Pattaya Second Road, stopping for a dragon show at Mike Shopping Mall, and then going to meet up with the first line at the Central Pattaya Junction. From there, the parade would proceed to the TOT Intersection. 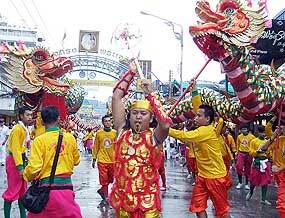 Later, the parade would reform at Sawang Fa Temple and travel to Lan Pho Naklua, and on to the Sawang Boriboon Thammasathan Foundation. I'm psyched for the Veg Fest this year in Phuket. I've seen it in some other southern cities but I think they pale in comparison. Indeed, they've had the yellow เจ signs up for a while now in Phuket Town and the Chinese temples have started getting it together. Some lunatic near my house has also taken to blasting off mortar-type fireworks in the evening and at night. I think has more to do with the very active pubs just round the corner, however. Sounds like a bloody warzone at times. Good. You like fruit and vegetables then? Oh Good. They're very good for you. What are your favorites? My nephew has participated in this many times. One year he sharpened the spokes of a cut alloy car wheel and stuck them through his cheek. The other year it was the forks of a bicycle. Well balanced young man my nephew. He gets it from his uncle then. actually, I thought it said phuket Vegetarian Festival. Never knew there was one in Pattaya. They do that sort of stuff in pattaya?